Too late to hunt turkey's No way! So what kind of idiot bowhunts turkeys in late December? After all, they can't be called, they're flocked up, and it's colder than heck out. Well, after watching a flock of turkeys since late November, I decided it was, perhaps, the best time of year to give it a go. hunters are pursuing them harder. One of the key benefits is the lack of leaves on trees. Roosted birds are much easier to spot from a distance and that gives you a chance to plan your morning hunt. 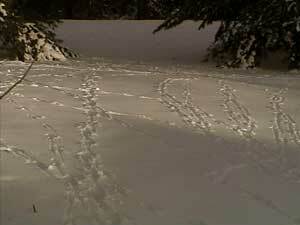 snow cover provides great clues to winter travel routes. Here a flock of turkeys, probably gobblers, have moved through during the last 24 hours. 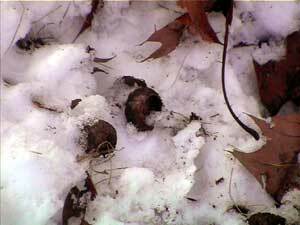 In the area I live (Northeast Connecticut) our turkeys spend much of their time scratching for acorns buried beneath the snow. During a recent scouting trip I noticed one area that was being consistently tore up by the turkeys. After finding this area I backtracked and found a roosting area where the birds seemed to be spending most of their evenings. I also found their pre-roost launch pad which seemed like a great place to setup my blind for afternoon hunts. 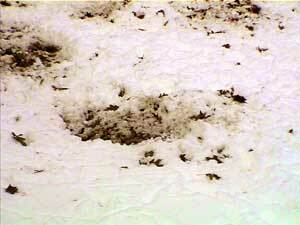 Diggings in snow reveal the targeted food source - acorns. 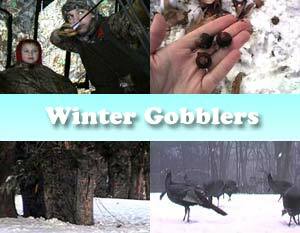 Here, the turkeys are digging for leftover mast from the fall. .
During several winter turkey hunts I've paid close attention to the types and frequency of turkey calls. The turkeys do a fair amount of tree yelps, and they do their normal fly-down cackles and feeding purrs, but once on the ground there are few calls made. I follow suit by calling only in key times during my hunt. For instance, if I know that the turkeys are nearby and potentially heading in the wrong direction, I 'll make some soft yelps and feeding purrs. But once they are headed in my direction I shut up and will not call any more. This is important as it's not natural for them to be yelping, or gobbling during this time of year. 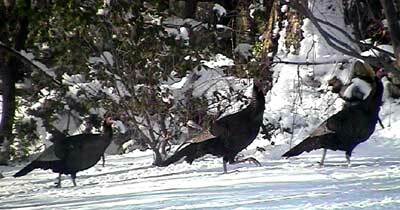 The exception is big groups of gobblers. They can be very vocal when they are bunched up and exhibiting dominance. I watched two gobblers spend 9 minutes pushing each other by their chests. It was fun to watch and those birds were as noisy then as they are in April. But a good rule of thumb is to call sparingly or not at all during late season. 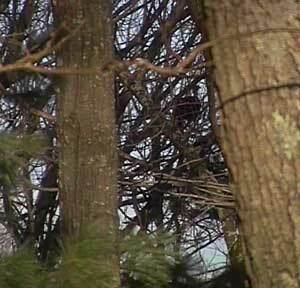 Roosted Turkeys are likely to call sparingly from the roost, and then at fly down. But once on the ground calling really slows down. Your best bet is to call sparingly, if at all. I use either a double bull or cutting edge blind for my winter hunts. I prefer to find an evergreen tree that is on the main travel routes or within the feeding areas. By setting up the blind in the shade under the evergreen I reduce the chance of backlighting in my blind. I'll try to spot the birds roosting the evening before and, if I'm feeling adventurous, I'll sneak in there well before light to catch the morning travel. From that point on it's up to the birds to follow their normal patterns. 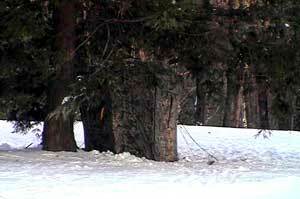 I prefer to set up my blind in the shade of an evergreen tree within the feeding or travel route areas.